Haha OMG this would be so great to win... Not sure if I would be able to read the whole things though. Fabulous giveaway for her fans! :) I'm not really. There is so much I don't know about the real Nicole. Awesome giveaway. Its amazing how she can pull off this style of hers. She is definitely one of a kind. I love her 'cause she is fun and sweet, and she's the reason why Jersey Shore is so successful! I have to say I love that Snooki is completely herself. People may judge her for the things she does but she rolls with it. I wish I could be that way! I've been curious about this book! I love Snooki & her hilarious one-liners. I'm already a follower of your blog and twitter! 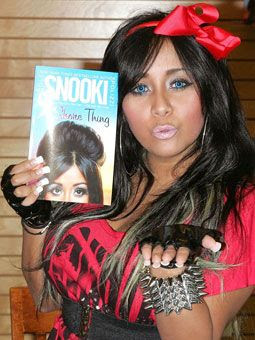 i love that snooki isn't afraid to be herself. a smart business woman is one who learns how to make money doing what she loves!!! Right now I love most that they're in Italy. Wait...no..I don't love that. I'm jealous. I wanna go back to Italy! What a bitchin little blof=g youv got going on here ! Oh my gosh, this is such an amazing giveaway. What's not to love about Snooki? She's so fun and completely fearless and shameless when it comes to being herself. She is something! Wow, it'll be cool to read about her. The cover is just perfect! What a fun giveaway! She is funny ... and definitely a character. OMG! Im in!) Its kind of funny to watch show but really addictive! Following you everywhere! What I like about Snooki: She is honest and has a good heart! Not a Style Icon ~lol for sure, but Im seeing some progress over the years! What I love about Snooki is that she is really comfortable in her own skin. Already follow you via GFC as nightowl.